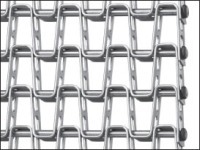 Key-Turn radius belting has all the characteristics of straight-line flat wire belts, with the additional capability of making right or left turns of up to 180 degrees (360 degrees for spiral systems). Reinforcing links strengthen outside edges. Available in 0.062" or 0.090" thick T-304 stainless steel material. One or two links may be placed on either edge. Reinforcing links on both edges enable belt to be flipped for longer life. Turning ability enables belt to avoid obstacles, operate in limited space, and eliminate troublesome transfers. Elongated slots allow pickets to nest, giving the belt the ability to turn and also providing for easy and thorough cleaning. Stainless steel Key-Turn belts are USDA approved for use in federally inspected meat and poultry plants. 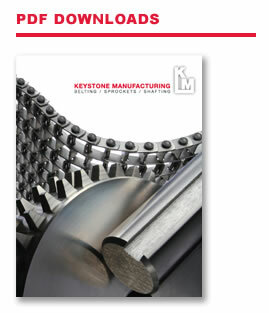 H series sprockets for heavy duty belts are suitable for Key-Turn belts. Minimum belt turning radius is equal to 2.2 times the belt width, measured on the inside radius of the belt. For tighter turns, two or more narrow width belts divided by a rail may be used. Conveyor should be designed to include a straight run 3 times the belt's width before engaging sprockets after a turn. Consult Keystone Manufacturing before using the belt in a non-powered turn situation, as this set-up can cause excessive strain. Maximum allowable drive tension is 300 pounds. 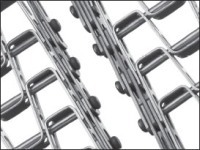 For belt speeds above 15 feet/minute, maximum drive tension is reduced to 200 pounds. Both load and return side belt supports should be either rollers or UHMW polyethylene to reduce friction to a minimum.